Ann Todd Jealous and Caroline T. Haskell, both experienced psychotherapists skilled at aiding dialogue about racial issues, are cognizant of the challenges that even the thought of such conversations often presents. Their anthology of 53 stories is based on the premise that for positive and lasting change to occur, hearts as well as minds must be opened. 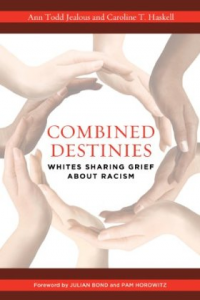 With Combined Destinies as its text, this workshop series will encourage participants to share their own stories, increase their compassion for all Americans and develop personal action plans toward the reduction of racism.